Edgar Allan Poe may not have lived the happiest of lives, but at least he didn’t have to endure The Raven. We’re not talking about Poe’s famous 1845 poem but a darkly hued thriller built around Poe’s final days. Drenched in overbearing melodrama, The Raven feels increasingly — though never enjoyably — ridiculous. Too bad because the movie springs from a clever idea. An impoverished and somewhat desperate Poe (John Cusack) discovers that a mysterious fiend is replicating murders taken from various of Poe’s exceptionally macabre short stories. This life-imitates-art scenario turns Poe into a kind of harried detective: When his fiancee (a bland Alice Eve) is kidnapped by the killer, Poe must race around the cobbled streets of Baltimore trying to save his damsel in extreme distress. Even before Poe becomes distraught over his fiancee’s disappearance, he’s depicted as cynical and depressed. Neither his work nor his love life seem to be going particularly well. Poe is having trouble selling stories to the Baltimore newspaper that printed many of them, and his fiancee’s socially conscious father (Brendan Gleeson) vigorously opposes his daughter’s relationship with the drunken, resourceless writer. Poe eventually joins forces with the Baltimore policeman (Luke Evans) who’s investigating the case of the kidnapped fiancee. After an initial period of mistrust, Poe and policeman work together to prevent Poe’s fiancee from becoming another of the author’s lovers to meet with a tragic end. Director James McTeigue (Ninja Assassin and V For Vendetta) probably didn’t realize it, but The Raven — with its mixture of heated dialog, gothic gloom and anachronistic language — might have made a terrific comedy. McTeigue and his cohorts evidently thought they were taking a serious journey into the dark corners of Poe’s psyche at a time when society seemed increasingly hungry for cheap, violent thrills. 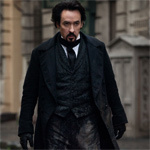 Miscast as Poe, Cusack’s performance is marred by occasional over-the-top tantrums and by Cusack’s inability to add the proper bite to Poe’s caustic turns of phrase, a skill the author put to good use as a prolific literary critic. Sarcasm needs to be savored, not spewed in asides, as if one is trying to say something memorable while racing to catch a train. Even the usually fine Gleeson, who’s stuck playing an ogre of sorts, may not want to press this performance into his otherwise splendid book of professional memories. In showing the movie’s murders, the filmmakers avail themselves of gory effects that happily were unavailable to Poe. An example: At one point a giant swinging blade cuts a literary critic in two, thus echoing a scenario dreamed up by Poe for The Pit and the Pendulum. Writers don’t necessarily lead the happiest of lives, but Poe deserved better than The Raven gives him, a thriller so botched that when its secrets are revealed, its tempting to greet them with a dismissive shrug.